Henri’s Reserve is a curated e-Boutique of Family Estate Champagnes - we cater to those looking to indulge in the luxuries of life. 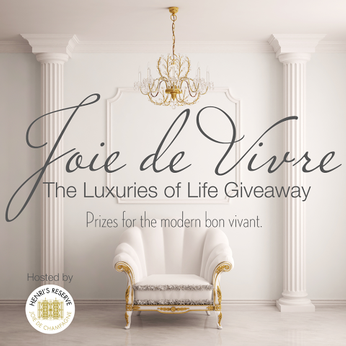 That’s why we are hosting an extravagant multi-brand giveaway called Joie de Vivre: The Luxuries of Life Holiday Giveaway! 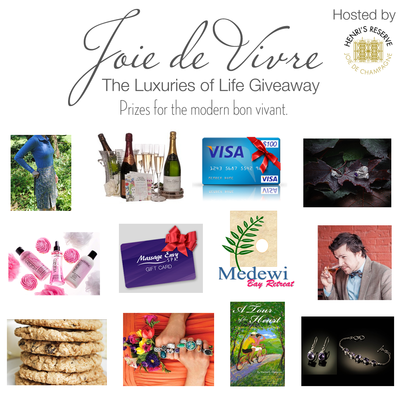 The giveaway will reward one lucky winner a grand prize of the luxurious products we love, from the finest Champagne to a 2 night stay at a luxury resort on exotic island of Bali and more! ONE LUCKY WINNER will receive the grand prize package! Open to U.S. residents only, must be 21 or over to enter. Entering is easy and can be done below via Rafflecopter. REMEMBER….the more points you earn the better chance you have to win! Henri’s Reserve is a curated e-boutique of Family Estate Champagnes, creative gifts (with gorgeous packaging) and “first time” bubbly experiences (aka tasting kits). Henri’s Reserve is the best place to buy exclusive, highly desirable short runs of Champagne because they have unique access to the French family vineyards that produce highly rated, limited production boutique champagnes (5k bottles per year or less). From tasting samplers and Champagne clubs to gift cards and gift sets, Henri’s Reserve offers the best choices in exquisite French Champagnes from the wine lists of the world’s most famous restaurants. Sweet & Simple Bake Shop was voted 2014 Best Bakery & Wedding Cakes in Fairfield, CT. We bake in small batches using all natural ingredients. Our baked goods are fresh and free of preservatives. We pride ourselves on being a small, neighborhood bakery and part of our community. Tom Fischer is the founder of BourbonBlog.com, the top online resource for bourbon and globally one of the most influential sites covering spirits, cocktails, and associated lifestyle that these consumers crave. Tom Fischer, one of the leading experts on whiskey and spirits, will educate and entertain you and up to 35 of your friends at your next tasting or event. He will assist you in planning a memorable experience tailored to your specific event. Alcohol not included. Winner responsible for transportation. Prize: Paperback copy of "A Tour of the Heart: A Seductive Cycling Trip Through France"
Bonjour Colorado is a website/blog that features the books by travel writer, Maribeth Clemente, as well as stories on food, wine, travel and more from Paris to Telluride. A Tour of the Heart: A Seductive Cycling Trip Through France - Part memoir, part love story, this narrative is a romantic ode to the most visited country in the world. PVB GROUP LTD, with it's head office in Sanur, continues to expand from Medewi Bay Retreat in West Bali to Sekuta Condo Suites in Sanur to the Gili Meno Bird Park Resort in Lombok. The company has now expanded to Pasadena Park in Otaki, New Zealand and Park Lane Resort in Jomtien, Thailand. Along with the many resorts, PVB also specializes in transport and a large variety of local activities at discounted prices. Jinja draws inspiration for beautiful, high quality, handmade coral and silver jewelry from local and global trends in affordable jewelry and accessories. This stunning Amethyst & Silver bracelet and earrings set is part of Jinja's Elegance in Silver Collection. Elegantly designed sterling silver and natural gemstone bracelet. Beautifully set with hinged silver holding each beautiful faceted Amethyst gemstone. Upscale resortwear line consisting of: skorts, shirts, dresses, shorts, pants and tunics. Sold to prestigious clubs and resorts around the country. Mostly all cotton with imported fabrics and made in the USA (NYC Garment District). Their wonderful cotton knit dresses feature a v-neck and drawstring empire waist. Winner receives a Skort. Imported fabric with superb construction: perfect for activewear. Buying an engagement ring, wedding band, or a piece of diamond jewelry is an important decision. After all, the jewelry takes on emotional significance so it has to be just right. It needs to be of a high quality so it looks as beautiful years later as it does when you purchase it. If it is a gift, you want the jewelry to take her breath away when she opens the box. We want to help you make the best decision so you get the perfect piece of jewelry at a price that you are happy with. You will get the highest quality jewelry when you shop at Yates & Co.
For more than 50 years, consumers have trusted the Vitabath brand for unparalleled skin cleansing and conditioning. Vitabath’s quality ingredients and rich fragrances indulge the senses and nourish the skin, resulting in a relaxing, yet invigorating, at-home spa experience. Our Cupcake Couture™ Dreamy Pink Frosting™ has the dreamy delectable scent of scrumptious champagne cupcake topped with pink frosting. Get a sudsy, bubbly Body Wash, revitalizing Body Mist and luxurious Hydrating Body Lotion in one fantastic Dreamy Pink Frosting™ Bundle. Special Offer for giveaway entrants! Silpada features high quality, handcrafted, .925 sterling silver jewelry. Some pieces include real stones and gems. Lifetime guarantee. Very affordable prices for the quality. Recipient can choose any piece of jewelry from the website valued at $50.00. We customize and personalize travel for our clients at resorts, land tours, cruises, air+hotel packages, vacation home, condo and villa rentals, saving our discerening clients a lot of money, time and stress; handing every detail for them; all AMEX travel perks including Pay With Points, where you can pay for part or all of your trip using your AMEX Reward Points. We are proud to be a Super Star Agency with Cruise Planners/American Express Travel and Winners, Best of Westport, Best Travel Agency, for three years in a row: 2012, 2013 and 2014, voted by our clients. Winner receives a complimentary one hour massage or facial at your local Massage Envy, courtesy of Eva's Best Travel And Cruises. Florida Sunshine Vacation Rentals offers you a fantastic choice of luxury villa, home, condo and townhouse rentals in Orlando, Florida and other destinations in the Sunshine State and beyond (we have holiday villas in the USA for rent with a satellite office in the UK). Known for the best Florida vacation rental deals and Luxury Vacation Home rentals in Orlando, Florida, Miami, Florida and more, whatever your needs for your next vacation get-away, we'll have a luxury vacation rental in Florida to suit your plans perfectly. Venturemom.com offers a weekly featured VentureMom story, an "etsy" style shop where moms can sell their products/services while managing their storefront, a free weekly eLetter sharing the stories of featured VentureMoms as well as other news/events, an "Ask VentureMom" resource, and three blog columns: What Would VentureMom Wear, Venturemom@Home, and soon VentureMom Baby & Child (Holly offers collages of products for each column and products are from the moms in her shop). This promotion is in no way sponsored, endorsed or administered by, or associated with, Facebook. We hereby release Facebook of any liability. Winner(s) will be contacted by email 48 hours after the giveaway ends. If you have any additional questions – feel free to send us an email: giselle@socialmedia22.com. Henri's Reserve is not liable for any of the products given away. Once the giveaway is over, the brands shown above may send you an email with an exclusive offer as a thank you for entering.